Heat oven to 450°F. Make pie crust as directed on box for One-Crust Baked Shell, using 9-inch glass pie plate. Cool completely on cooling rack. Meanwhile, in heavy 2-quart saucepan, mix sugar and cornstarch. In small bowl, beat half-and-half and egg yolks with whisk. Gradually add egg mixture to sugar mixture; heat to boiling over medium heat, stirring constantly. Boil 1 minute; remove from heat. Stir in butter, coconut and vanilla. Press plastic wrap on surface of custard to prevent tough layer from forming on top; refrigerate 30 minutes. Spoon custard in baked pie crust. 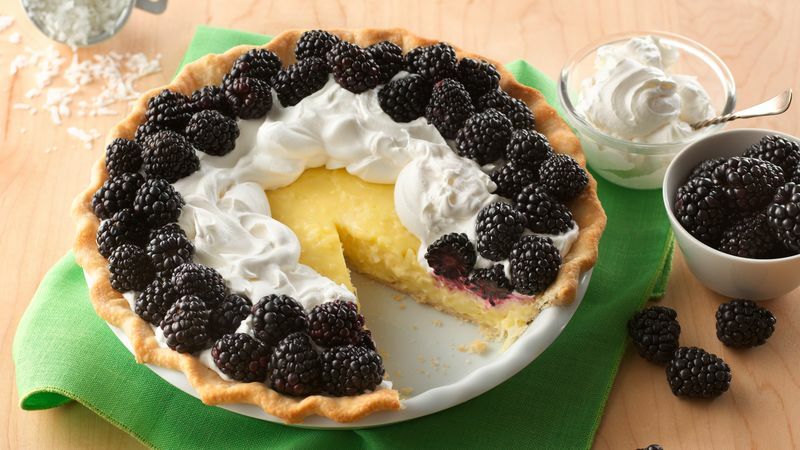 Top with blackberries and whipped cream. Refrigerate about 2 hours or until set. Cover and refrigerate any remaining pie. Swap the blackberries for your favorite berry, such as fresh blueberries or raspberries. Eat leftovers within 2 days.